This is the last of ATL LOVE Series! Thank you to Natalie, Lesley, Nicole, Patty, Lindsay, Jana, Erika, Amber, and Natasha for covering this blog space while I've been busy unpacking. We'll return to regularly scheduled blogging later this week! 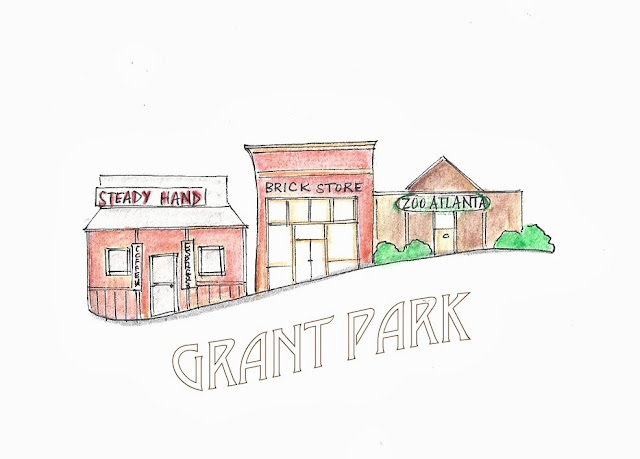 Our last stop of the ATL love series we're head to Grant Park! Natasha Steinberg of Tartlet Sweets is showing us around her 'hood. Natasha is a talented photographer, recent grad school graduate, and lawyer to be. Her seed and nut loaf recipe is crazy delicious! What you love about your hood: It's beautiful, tons of trees, unique houses, quiet, and walkable. Favorite breakfast/brunch: My house! Breakfast is my favorite meal, and we hardly ever have it out because we love to make it ourselves. Favorite coffee stop: SteadyHand Pour House. Although they're in transition, I'm still super loyal to them... partly because one of the owner's is my boyfriend, but my answer would be the same even if that weren't the case! Best working lunch: I used to work in Midtown and absolutely loved going to the food truckson Thursdays. I'm sadly too far away now for that to be a feasible working lunch, but I'm sure it's still just as awesome. Best date night bet: Once upon a time, I would have said Pura Vida, which is no longer open unfortunately. Now, I would say Abattoir. It's in a cool area and isn't too crazy. We have sat at the bar a couple times and ordered some plates and wine, and it has always ended up being the perfect, unplanned date night! We are also huge fans of dates on Buford Hwy. It's fun to try out different kinds of amazing food, and it's cheap! Favorite dessert stop: Cakes & Ale or Little Tart... I love a good pastry, and both deliver on that front. Donuts, pie, or ice cream: Morelli's has amazing ice cream. The rosemary olive oil is my favorite. Diner, greasy, spoon or grab and to-go dinner: Hankook! The sesame fries are toooooo good. Neighborhood Shop or Farmer’s Market: Grant Park Farmer's Market is one of the things I look forward to every weekend, which is probably a given considering I live in the neighborhood. They have so many awesome vendors, and I am usually able to get all my fresh veggies for the week. Non-food shopping: I love wandering around Kudzu and picking up random little things. Highland Row Antiques and Young Blood Gallery are good for that too. Thanks Meghan! I loved this series! !